Why over 50 different militaries around the world trust one name — GLOCK. 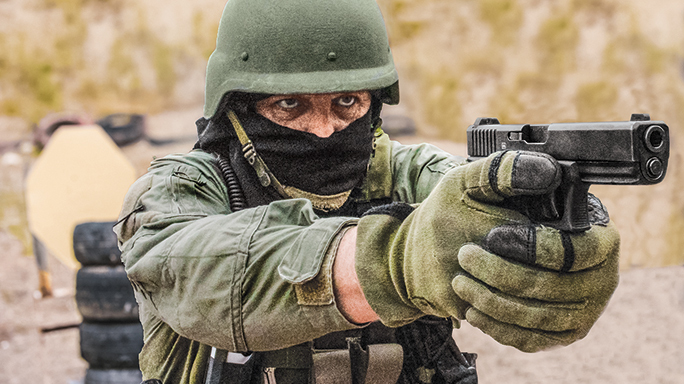 Many special operations warriors rely on GLOCKs because of their superior reliability. 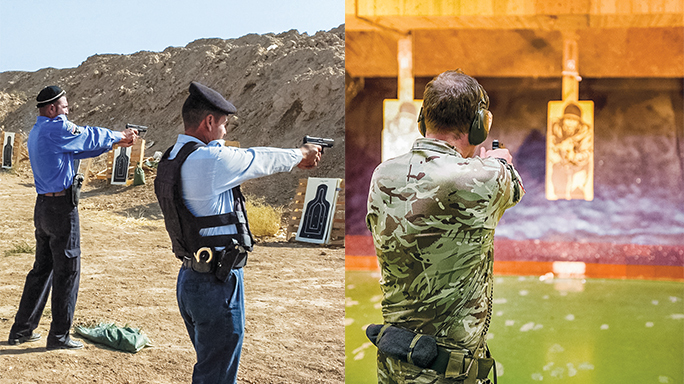 Many U.S. allies around the world have adopted GLOCK pistols, including the British Army (right), which ordered over 25,000 GLOCKs to issue to its troops. GLOCKs have served in all corners of the globe and in every imaginable climate. GLOCK is a name that is almost synonymous with law enforcement around the world. In the United States alone, approximately 65 percent of all law enforcement agencies issue GLOCKs as their duty weapons. However, the GLOCK SAFE ACTION pistol has seen its fair share of use beyond law enforcement circles as well. The ingenious GLOCK design actually came about to serve in the hands of those who stand in the breach against the most dangerous of foes and started its battle-proven service in the military. also helps absorb felt recoil. GLOCKs consist of only 34 component parts, a significantly lower number of parts than the semi-automatic pistol designs of GLOCK’s competitors. This smaller number increases reliability by reducing the potential for technical problems. The cost associated with spare parts inventory is also reduced, which contributes to the lower overall maintenance costs for the life of a GLOCK pistol. GLOCKs can be field-stripped without tools in seconds. In fact, a qualified GLOCK armorer can completely disassemble and reassemble a GLOCK pistol in seconds. Given the nature of military use, guns are exposed to incredible amounts of wear and tear. GLOCK applies advanced surface treatments on major metal components, resulting in a finish close to diamond hardness. This considerably reduces wear and tear on these metal components and makes them corrosion resistant, even when operating in saltwater conditions. 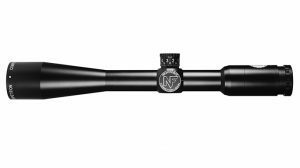 The matte black surface also minimizes light reflection — an advantage in tactical circumstances. This attention to detail is even carried into the design of each GLOCK magazine, which utilize a unique polymer coating that reduces the impact on the magazine lips and body if dropped and protects the internal metal frame from corrosion. Another advantage: The unique construction of GLOCK pistols allows for a high magazine capacity relative to their physical size. All of these things make GLOCKs perfect for those who operate in austere conditions where mud, sand, dirt, water or snow make pistols prone to malfunction. 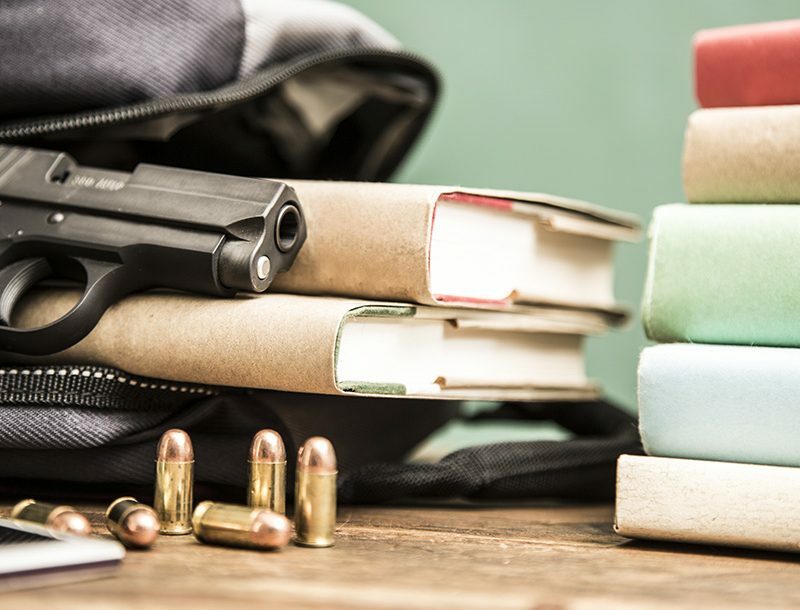 And so the seed was planted in 1980, when a brilliant engineer named Gaston Glock received a formal invitation from the Austrian army to develop a new service sidearm. In less than 24 months and after extensive competitive testing, GLOCK was awarded the contract. From that point forward, the firearms world would never be the same. The Austrian army chose the GLOCK SAFE ACTION pistol as its primary sidearm because it fit a rigorous set of criteria, including high accuracy, reliability and capacity requirements. A byproduct of training with Western powers is the exposure to professional, top-tier gear. The United States military has practiced with and provided training to various allies, such as Colombia, and introduced them in many cases to GLOCK pistols. This has resulted in significant contracts with these nations. Of course, the GLOCK design requires much less lubrication than comparable pistols, making it perfect for harsh environments, such as jungles or deserts. While certainly one of the smallest militaries to make our list, the Latvian military is one of the best-trained and professional groups in Europe. Its small size and limited resources make its weapon and training choices serious business. 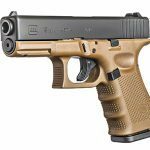 Latvia is a relatively new member of NATO, and its choice to issue GLOCK pistols shows its desire to provide the very best equipment to those who would defend the proud nation against a variety of threats. The GLOCK SAFE ACTION pistol has become a worldwide phenomenon over the years. In addition to what is termed “big army” use, GLOCKs are also found in the hands of some of the most elite soldiers in the world. In some cases a military may decide not to issue a GLOCK, or any sidearm, to its main body of soldiers. That changes, however, when the soldiers concerned are in special operations. These professionals have training and skills that exceed those of a standard soldier. With that training comes not only more danger, but also an appreciation for weapons that serve their needs. GLOCK is the go-to gun for many of these quiet professionals. Some of the first in this realm to carry GLOCKs were Austria’s Jagdkommandos, an elite counter-terrorism and counter-insurgency team on par with the world’s best. Another highly trained unit that uses GLOCKs is the Czech Republic’s 601st Special Forces Group. Similar in task and function, the Czechs understand the need for serious weapons for serious times. One of the most recent additions to this list is the U.S. Marines, or, more specifically, the Marine Corps Forces Special Operations Command (MARSOC). In February of 2015, the Marines officially allowed MARSOC units to use the GLOCK 19 as their sidearm. 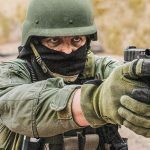 While the Marine Corps had just completed a recent pistol update, GLOCK pistols were still the preferred weapons of many inside the MARSOC community. Their reliability and ease of use make them a reliable companion in dangerous places. France is another country that has turned to GLOCK. In fact, the French Special Forces, along with some of the conventional army units, carry GLOCKs as their sidearms. 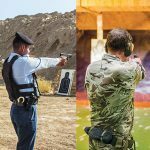 The French are big believers and have gone so far as to issue several GLOCK models to various military units. These pistols include the G17, G19, G26 and G34. In 2011, the Swiss Army chose GLOCK as the new service pistol for the Swiss Army Special Forces. This decision was made after a lengthy evaluation process conducted by three independent elements of the Swiss Army. The GLOCK pistol models ultimately selected were the GLOCK 17 Gen4 and the GLOCK 26 Gen4, both 9×19 semi-automatic pistols, as well as the GLOCK 17T training pistol, which can fire FX marking ammunition. Another entity that uses GLOCK pistols is the Slædepatruljen Sirius (Sirius Sled Patrol), an elite Danish navy unit that conducts long-range reconnaissance patrolling and enforces Danish sovereignty in the Arctic wilderness of northern and eastern Greenland, an area that includes the largest national park in the world. Patrolling is usually done in pairs, sometimes for four months and often without additional human contact. Selection and training for this group is some of the toughest in the world. These teams have the unique distinction of being issued the 10mm AUTO G20 as defense against polar bears. The Portuguese Marine Corps is the special operations division of the Portuguese navy. Like their compatriots around the globe, they specialize in small-unit counter-terrorism actions, guerrilla warfare, raids and boarding operations. They are an elite quick-reaction force and have a very good reputation in the special operations community. Because of their extensive maritime operations, they sought out a pistol that could stand up to the rigors of sea operations while being equally at home on dry land. As with many military units, the GLOCK 17 became their weapon of choice. 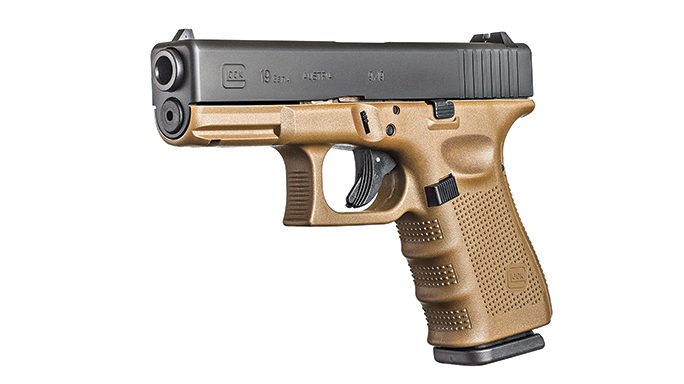 At this time, there are more than 50 different militaries issuing one or more GLOCK models. As the battlefield evolves, so must the weapons that are brought to bear. This has been especially true during the extensive amount of time spent by militaries in Iraq and Afghanistan. Mechanical failures were common in everything ranging from multi-million-dollar aircraft to rifles. But one tool weathered this storm well and proved itself once again — the GLOCK.